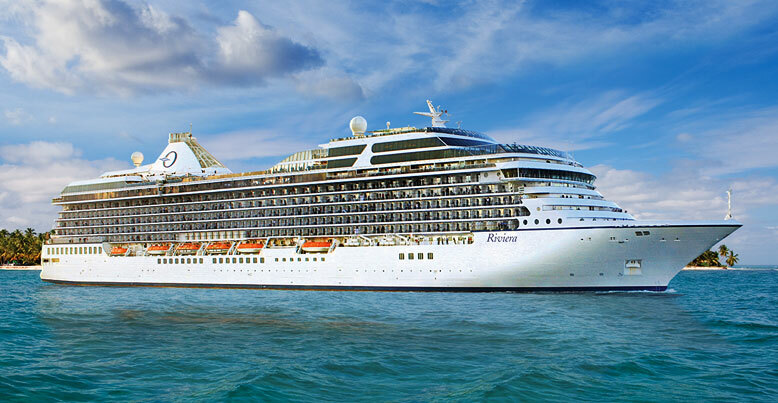 It is undoubtedly an audacious claim, but during a recent journey aboard the 1,250-passenger Riviera, I became convinced this is a cruise line which is unswerving in its policy of no compromise when it comes to everything epicurean. 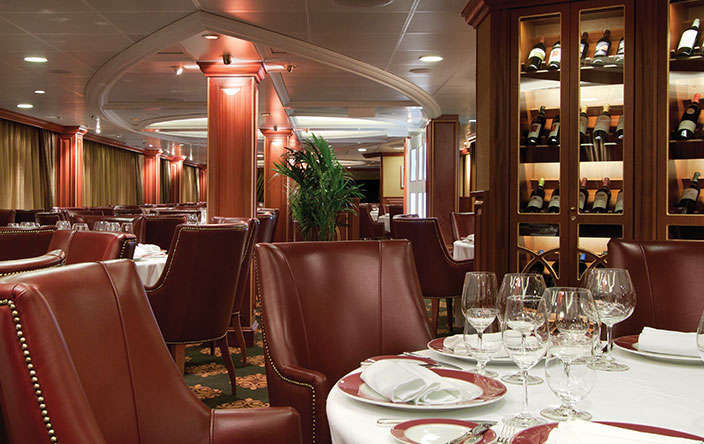 Cuisine at sea has evolved from Thermos to thermidor. 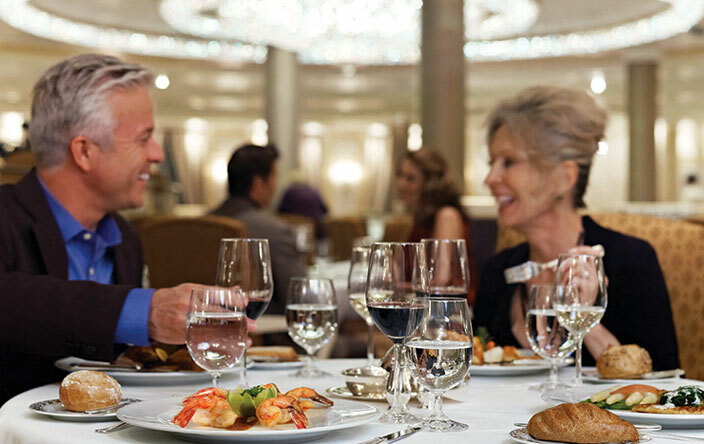 A century ago passengers were served hot soup during arduous voyages across the seven seas; today Oceania Cruises boasts menus that offer a world of choice – a preponderance of then from France. The entire nation has an ongoing love affair with food; aboard Oceania Cruises the culinary management team isalmost exclusively French. 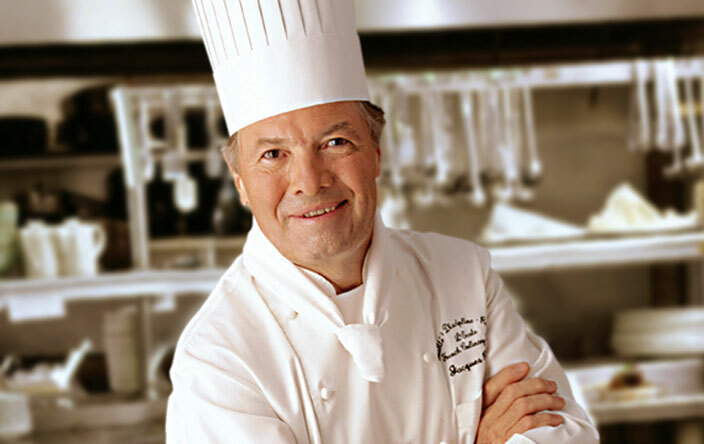 When the company was founded in 2002, celebrated Master Chef Jacques Pépin was appointed Executive Culinary Director. One of America’s first ‘celebrity chefs’, Monsieur Pépin was personal chef to three French heads of state, including Charles de Gaulle. He was instrumental in the company’s decision to enlist twice as many chefs in their galleys as other deluxe vessels carrying similar numbers of passengers, thus ensuring every meal is prepared á la minute. Franck Garanger takes up the story, “There is so much emphasis placed on cuisine by Oceania that we have to ensure that food is the alpha and omega aboard our fleet. Oceania chefs have worked in the world’s most prestigious hotels and restaurants, including the Grand Hotel on Mackinac Island in the U.S. and La Maison du Seigneur in Belgium. Little wonder it is the only cruise line to have been inducted into L’Association des Maîtres Cuisiniers de France. As Riviera headed south through the Caribbean, Franck talked about his career. “My passion for cuisine began in my father’s patisserie-boulangerie in the Loire Valley. This inspired me to enrol as an apprentice in the Michelin-starred restaurant ‘Le Vert D’Eau’ in Angers with French Master Chef Jean-François Piers. This was followed by tenures at the Hotel de Paris in Monte Carlo and the Hotel du Cap Eden Roc, Antibes; as well extensive work with such culinary greats as Paul Bocuse, Alain Passard and Thierry Marx. Franck might be too self-effacing to discuss his accolades, but I discovered that in 2008 he attained the position of French Master Chef in the Maîtres Cuisiniers de France; and has recently been recognized with membership of the Academie Culinaire de France. I wanted to get a better appreciation of the bold claims this enthusiastic chef had made, so he took me on a tour of the kitchens on board Riviera. Entering the main galley he extolled, “Not only do we have the highest food cost per passenger in the cruise industry, our galleys have the highest space per passenger and the highest ratio of chefs per passenger.” I didn’t count each and every one, but Franck assured me that aboard Marina and Riviera there are no fewer than 160 chefs – a ratio no other cruise line can match. When we reached the Patisserie Franck got even more enthusiastic. Delving into a sack of Planchot and Viron flour from Chartres, he said, “This is the flour we use just for the baguettes we serve at dinner. Tell me which other cruise line imports its flour from France” At another sack he extolled the quality of the Poulichette flour from La Roche-sur-Yon in the Vendée, which is used for the breakfast and lunch baguettes. “We also import Elle & Vire butter from Normandy to ensure we serve the finest croissant and pain au chocolat,” he boasts. “The traditional ingredients cannot and will not be compromised,” he emphasised. In the galley that is the preserve of the cuisine served in Jacques, Franck shows me Iberico de Bellota pata negra ham; Rougie foie gras ‘selection prestige’; as well as black truffles from Perigord. “This stuff costs a fortune, but it’s an integral part of Oceania Cruises’ DNA to serve only the finest ingredients.” I am also shown prized ingredients that are served in other restaurants on board such as Brittany blue lobsters; Culatello ham; Dublin Bay prawns; Artequeso currado manchego cheese and Fleur de sel Arbaquinia Spanish olives. 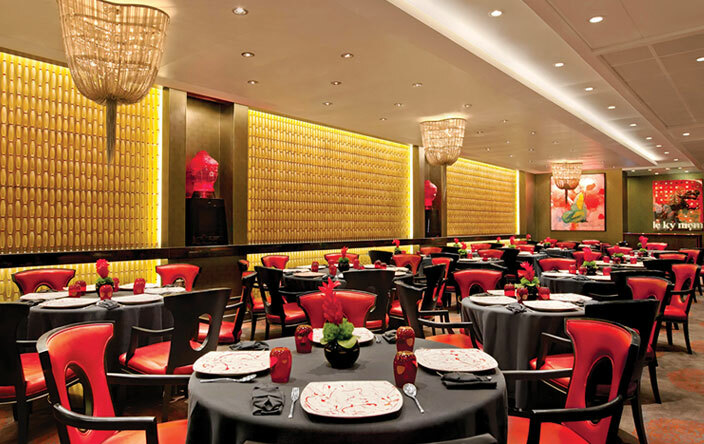 During my time on board, 11 new dishes were introduced to Red Ginger, the popular restaurant that features the cuisines of Thailand, China, Japan, Vietnam, and other Asian countries. By the end of the year, appetisers and desserts will be updated in the Polo Grill; while new, authentic dishes will be added to the Italian menu in Toscana. Aboard Marina and Riviera all guests are guaranteed four reservations in the speciality restaurants and anything additional is subject to availability. There is no supplementary charges for dining in any of these rooms, although in the 24-seat La Reserve, the Explorer and Odyssey dégustation menus costs $95; while the Connoisseur menu costs $165 – with each of the seven courses paired with fine wines and champagnes. The ultimate private dining room, Privée, accommodates a maximum of ten guests, costs $250 and has dedicated waiters offering cuisine from Polo Grill and Toscana. Savouring dinner in Red Ginger Franck waxes lyrical again. “If just 10 per cent of our guests see the efforts we go to and appreciate the difference that peerless ingredients make; that is our reward.” When several guests spotted us savouring a spicy Lobster Pad Thai followed by Chilean Sea Bass in Miso-Plum Sauce, they came over to say how much they had enjoyed the excellent cuisine. One of cruising’s most distinguished writers. Gary regularly contributes to national newspapers and is the author of three books on the QE2. He was the winner of the Best River Cruise Feature category in the 2014 CLIA cruise journalism awards for his World of Cruising article on the Zambezi Queen.